Regular Joe: Easter 1916 - The Gorgeous Wrecks & The Cricket Bat That Died For Ireland. Easter 1916 - The Gorgeous Wrecks & The Cricket Bat That Died For Ireland. * The Christian Brothers who taught me about Irish history presented Easter, 1916 as a heroic epic, the founding myth of our Republic. They were muscular men, a generation or so on from the Rising, the War of Independence and our brutal Civil War, the latter being a subject that was still too raw to even mention in the classrooms of Cork in the 1980s. They revered Pádraig Pearse, a teacher and strict disciplinarian after their own hearts, and believed in his doctrine of blood sacrifice, linking it to the men of 1798 and even further back to our original muscular Christian, brave, martyred Brian Boru. Brian Boru - the High King of Ireland and scourge of the Vikings! - was presented in the same way we learnt about the early Christian martyrs, the Roman Legionnaires put to death for refusing to chuck their fellow Christians to the lions. In many ways, in their admiration for Pearse and mania for discipline, they were the paramilitary wing of the Catholic Church. To my young, over-active imagination, Pearse was a cross between the hot-tempered Brother who tried to “bate” Irish into us and John Wayne at the Alamo, running his young volunteers through the tuiseal ginideach even as he fired his rifle from the burning wreck of the GPO. In our homes, Michael Collins was revered, his portrait hanging alongside a picture of John F Kennedy and the Pope, Cork’s own Blessed Holy Trinity. DeValera was mentioned only in dark whispers, a bogey-man. The events of 1916 didn’t seem real to us, even though they happened when our grandfathers were alive. And there was no connection made to the Troubles, to the nightly news reports about the Hunger Strikers, names such as Bobby Sands, heard as we sat around the table for our tea. It is only in recent years, having gone back and looked at the events of 1916 for myself, that I have been able to find a way into the Easter Rising via some of the small, forgotten stories behind the Great Myth. As a history nut, and having written a book about long forgotten Irish men who did everything from run the French slave trade to invading Imperial China, I see the small stories of individual men and women as a valuable way to approach Great Events from a different angle. And 1916 has a wealth of small stories which can give us a sense of what it must have been like to live through those times, the sudden chaos, the trauma and the conflicting emotions and loyalties. One episode, a tragic side-show to the doomed struggle on O’Connell Street, gives us a striking picture of the confusion and tragedy of Dublin, Easter 1916. It is the story of The Gorgeous Wrecks, how, on Easter Monday, April 24, a small party of volunteers occupying Clanwilliam House by Mount Street Bridge fired on a detachment of Home Defence Force volunteers. The Home Defence men were a sort of Dad’s Army, mostly elderly Dubliners, loyalists, veterans of the British army and colonial wars. They wore armbands with the inscription “Georgious Rex” (King George) and their creaky, grey-haired ranks were known affectionately to Dubliners as “The Gorgeous Wrecks”. The Wrecks had been out on an Easter Monday parade in full uniform and just stumbled into the volunteer strong-point. The 17 volunteers in Clanwilliam house opened fire, killing four of the Wrecks and wounding others before they realised, to what some later said was their horror, that these were not British Army regulars, but the Dad’s Army that Dubliners were accustomed to seeing parading on high-days and holidays. The jolly old Gorgeous Wrecks. We could hardly find a better snapshot of a peaceful, loyal city of the Empire suddenly overwhelmed by sudden, shocking violence and confusion. I am also drawn to the story of The Cricket Bat That Died For Ireland. 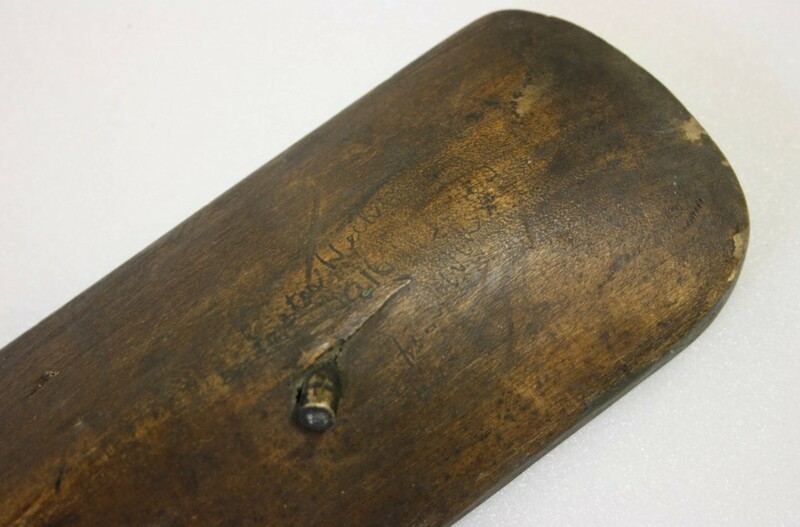 This bat – now in the National History Museum – was in the shop window of Elvery's Sports in Sackville Street when it stopped a bullet from a British gun (the spent bullet still lodged in the bat is a .303). To me, this strange, very Anglo-Irish memento vividly represents the destruction and chaos of the Rising. Contemporary accounts tell of street urchins looting bats, balls, lacrosse sticks and polo mallets from Elvery's and parading them like trophies around the edges of the fighting. One of the many surreal sights of a battle being fought in the heart of a busy, mercantile city. Recently, I also came across the story of Captain Jack White, the son of an Ulster-born British Field Marshall and a decorated hero of the British Army himself. Jack followed a strange path from Winchester Public School and the Royal Military College at Sandhurst, fighting in the Boer War and then throwing in his commission to embrace radical socialism, free-love and the cause of Ireland. It was White who brought his military experience to organising The Citizen’s Army. He did not fight in 1916 but when he heard his great friend James Connolly would be shot, he tried to organise the Miners of South Wales to come out on strike to put pressure on the British Government to commute the sentence. White, who later went on to fight for the Republicans in Spain, battled sectarianism at home and tried to organise a socialist party in Ulster, was (in his own words) a miss-fit, one of the many men and women who saw the ideals of Connolly and brotherhood turn to dust in the years after 1916. Easter 1916 as some sort of profound, teachable lesson for modern Ireland. Thanks to the internet and the great efforts of historians (academic and amateur) to put a wealth of history online, we can all now go back and look at the events of 1916, and look at the people and smaller events that never made the history books or the heroic myth. These are the stories that I would tell about The Rising. *** You can read more about the cricket bat Here - an excellent blog about its history and significance.